Kocsonya [ˈkot͡ʃoɲɒ] is an Eastern European festive dish, that truly defines the “nose to tail” eating that entails using the less fashionable cuts. “If you’re going to kill the animal it seems only polite to use the whole thing.” as the often quoted Fergus Henderson said in his book on this topic. The dish is savoury and eaten cold. 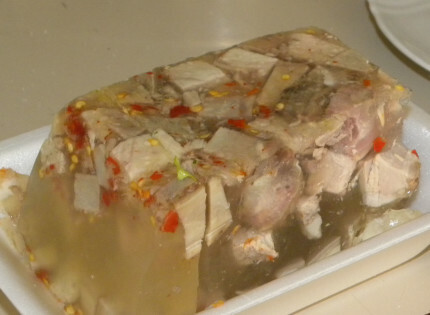 The cooked meats nearly always pork, seldom fish, covered with aspic like gelatin. The cuts to select are pigs’ feet, ears, tails or heads and a combination of scrap pork meat. Slowly cooked for hours so that the gelatin melts out and sets the dish when cooled, no need to add anything else. It is rich in collagen, the protein responsible for skin and muscle tone and will make you look and feel younger. You will need a large stockpot about 8.5 litre capacity. Divide the meat and cooked vegetables into serving bowls, only minimal bones or none at all should be served. You can put hard-boiled egg halves in there with the meat too. Ma always took the feet/ sliced in half, and singed any hair off. But, she added , make them nice and rosey before you place in your pot to cook. I took it to the grill, and lay them on , flipping and making sure they don’t burn. This is a time saver from prepping each piece. But we didn’t have a grill 50 years ago. I go further and splash them a bit with soy sauce, or booze, or whatever works. Actually ,I use a mister to keep them moist and from burning. Regardless of all that, a really nice dish, with pumpernickel bread and a good beer. I prepare this in summer and keep in outside fridge when too hot to cook. This recipe brings back wonderful memories. Kocsonya was my grandfather’s favorite dish. My grandmother, or nagymama, was a great cook and always indulged nagytata’s culinary requests. That’s the way it was in those days. Treasured memories, and some good tips!